Sir Sean Connery - to Edinburgh, and beyond! Sir Sean Connery played it for laughs with Toy Story cowgirl Jessie last night and joked: "You remind me of my mum." 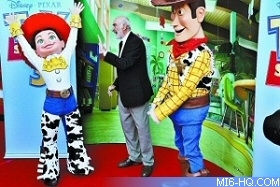 He made the quip - a reference to his late mother Effie - before the British premiere of Toy Story 3 at the Edinburgh International Film Festival. There was a loud cheer when Sir Sean, 79, pulled up in a black BMW and emerged with wife Micheline. The James Bond legend signed autographs and shook hands with fans at Cineworld in the city's Fountainbridge, where he was raised. He also joked around with Woody, threatening to punch him after he high-fived him too hard. Tickets for the premiere sold out in less than an hour.